This play is for anyone who has ever owned a dog, loved a dog, or wanted to wring a dog’s neck. Greg and Kate have moved to the city after twenty-two years of child rearing in the suburbs. Greg’s career as a financial trader is winding down, while Kate’s career, as public school English teacher is beginning to offer her more opportunities. Greg brings home a dog he found in the park - or that found him - bearing only the name “Sylvia” on her nametag. 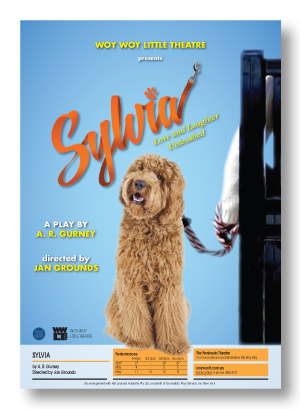 A street-smart Labradoodle, Sylvia becomes a major bone of contention between husband and wife. Sylvia offers Greg an escape from the frustrations of his job and the unknown of middle age. To Kate, she becomes a rival for affection. And Sylvia thinks Kate just doesn’t understand the relationship between man and dog! Here is a delicious and dizzy romantic triangle between Greg, Kate and a mongrel called Sylvia, who, as Kate puts it, eats a serious hole in their 22 year marriage. Fridays @ 8pm April 27, May 4 & 11. Saturday @ 2pm May 12. Saturdays @ 8pm April 28, May 5 & 12. Sundays @ 2pm April 29, May 6 & 13. "Dramatic literature is stuffed with memorable love scenes, but none is as immediately delicious and dizzy as the one that begins the redeeming affair in A.R. Gurney's new comedy, SYLVIA…" —NY Times. "I can only call it one of the most involving, beautiful, funny, touching and profound plays I have ever seen…" —NY Daily News. "Gurney's mad comedy is the most endearing good time to trot down the pike in many a moon. Howlingly funny…" —BackStage. Opens Friday 27 April 2018.